On Saturday(June 17th) Lake Bell attended the premiere of her new film 'Shot Caller' during the 2017 Los Angeles Film Festival at the ArcLight Cinemas in Culver City, CA. She hit the red carpet in a light blue WOLFORD knit top and STELLA MCCARTNEY SPRING 2017 navy paperbag trousers with a gathered, drawstring high waist and side pockets which she utilized. You may remember that Winnie Harlow wore the pants in olive in March 2017. A touch of color came via her PIERRE HARDY color-block sandals. DEAN DAVIDSON jewelry, a LEE SAVAGE clutch and light wavy tresses finished up her look. 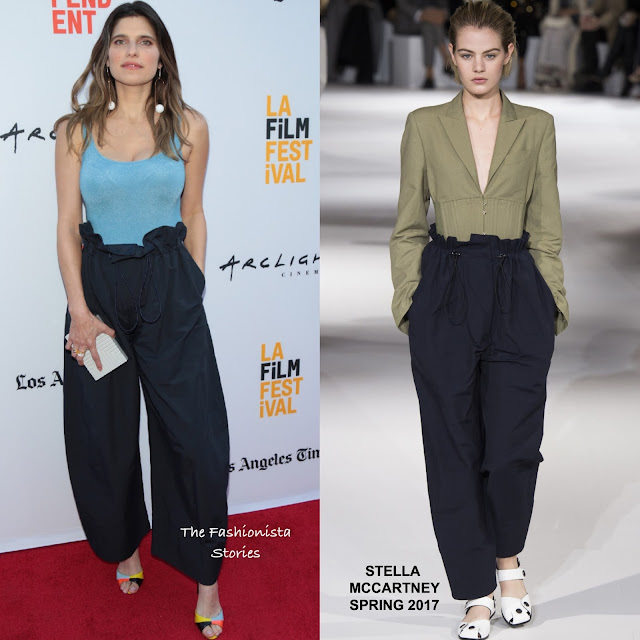 You can get Lake's Stella McCartney trousers on sale at FARFETCH and her Pierre Hardy sandals on sale at SPRING & FARFETCH.